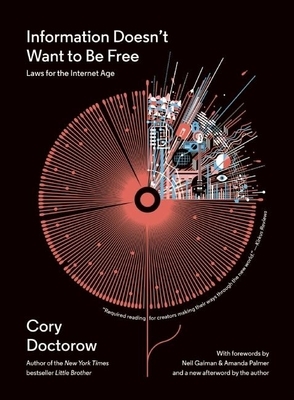 In sharply argued, fast-moving chapters, Cory Doctorow's Information Doesn't Want to Be Free takes on the state of copyright and creative success in the digital age. Can small artists still thrive in the Internet era? Can giant record labels avoid alienating their audiences? This is a book about the pitfalls, and the opportunities, creative industries (and individuals) are confronting today--about how the old models have failed or found new footing, and about what might soon replace them. An essential read for anyone with a stake in the future of the arts, Information Doesn't Want to Be Free offers a vivid guide to the ways creativity and the Internet interact today, and to what might be coming next. Cory Doctorow is a science fiction author, activist, journalist, and blogger, as well as the coeditor of Boing Boing (boingboing.net) and the author of young adult novels like Homeland, Pirate Cinema, and Little Brother and novels for adults including Rapture of the Nerds and Makers. The former European director of the Electronic Frontier Foundation and cofounder of the U.K. Open Rights Group, he lives in London. Neil Gaiman is the #1 New York Times best-selling author of more than twenty books for readers of all ages, and the recipient of numerous literary awards, including the Shirley Jackson Award and the Locus Award for Best Novelette for his story "The Truth Is a Cave in the Black Mountains." Originally from England, he now lives in America. Amanda Palmer rose to fame as the lead singer, pianist, and lyricist for the acclaimed band The Dresden Dolls, and performs as a solo artist as well as collaborating with artists including Jonathan Richman and her husband, author Neil Gaiman. She is the author of The Art of Asking.